This is a brand I hadn’t heard of until recently but without doubt this is definitely the best brow product I have ever tried. 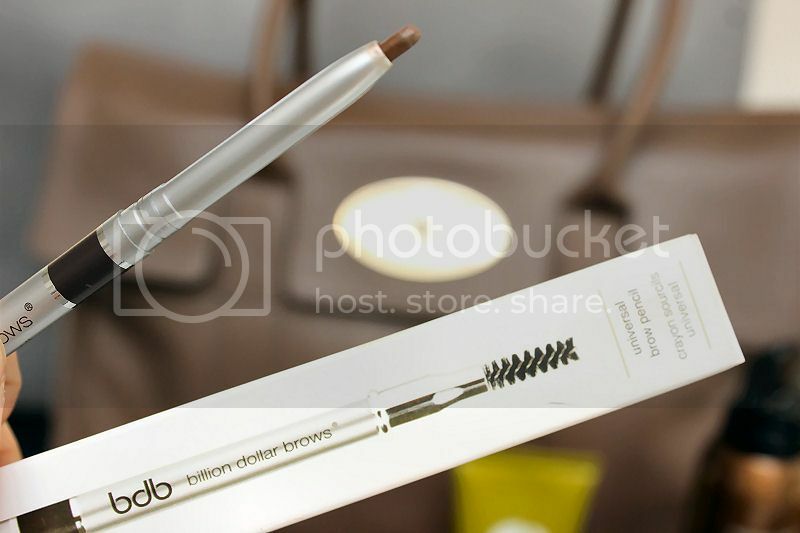 In the past I have used brow pencils from the high street and then I turned to powder as it looks more natural but the Universal Brow Pencil by Billion Dollar Brows is the perfect combination of the two. The shade is perfect for my brows unlike any other products I have tried and the product is in a retractable pencil so it is convenient and easy to store and travel with. The product applies beautifully to my brows, is easy to use and has an extremely natural finish, so much so that you can’t even tell I have filled them in. The pencil also sports a brush at the end too.. what more could you ask for?! I will be writing a full review on this product soon… watch this space. Black Track is a product that shamefully has been in my make-up collection for quite some time but I have been put off using it because it seemed like hard work in comparison to using a pen or pencil liner. How wrong I was. Last month I used this product pretty much every day with a slanted brush (MAC 266) and it was extremely easy to apply, if not easier than using a pen. I was blown away by how simple it was and now I really regret not using this product sooner especially to create a flick because you can be so much more precise meaning it is far easier. 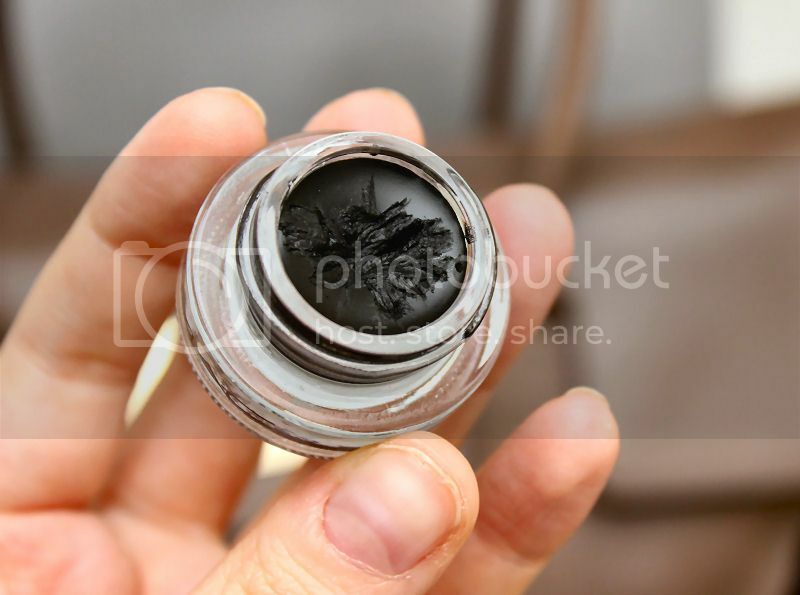 The only down point about Black Track is that although in the pot it is jet black when you apply it sometimes you can see your eyelid through it so you may need to apply a second coat or set it with black eyeshadow such as MAC Carbon. This can also occasionally rub off a little on my lid so I have to check it throughout the day but I still love it. Over the past few weeks I have been introduced to a new hair care brand by hairdresser Michael Van Clarke. It started with me attending an event (read review) all about the 3 More Inches range which involved a presentation by the man himself and then the following week I went back to the salon to have a haircut (read review) using the diamond hair cut technique. 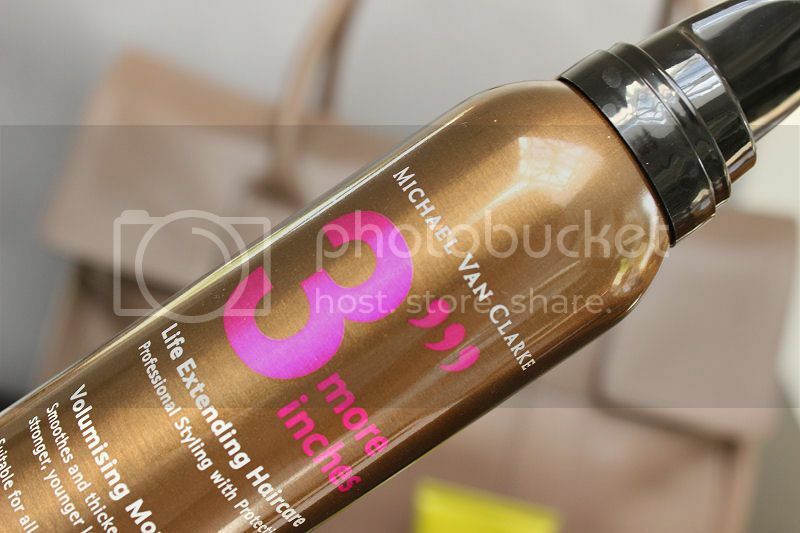 Since having my haircut at the salon I have been using all of the Michael Van Clarke products, all of which are brilliant but the one that is featured in my blog post today is the Volumising Mousse. In the past I’ve used mousse to try and create beachy curls or to simply add volume to my hair when blow drying it but I found they were a bit hit and miss and often dried out my hair. The Michael Van Clarke version is different. So far it it hasn’t dried out my hair at all and whether I use a small amount of product or a more generous amount it works and doesn’t leave my hair sticky or heavy. The reason why this particular product is featured in my favourites though is because it is the one product I have used and been able to achieve beachy waves with ease. I’ve literally tried to create this look for months but it’s never ended up how I’ve wanted but finally I was able to re-create it using this mousse and by scrunching up my hair whilst blow drying it. This product also smells lovely although it is subtle. Last month I did indulge in a very extravagant purchase and that was the Taupe Bayswater Mulberry bag. I had my eye on this bag for around two years and had always been put off by the high price tag but as the Mulberry sale was on I decided to just go for it once and for all so I got it. The quality of this bag is beautiful. Everything from the design, leather, colour and smell are perfect and the highest quality… I love it. A full review will be up next week. Last month I found my skin getting a little dry so I decided to invest in a new skin care product to help. The one that first jumped to mind was the Origins Drink It Up Facemask so at the first opportunity I had I headed to the shopping center to get it. After using this product just once my skin was left silky smooth and extremely soft. Admittedly, I did use this product more regularly at first than the packaging advised but I wanted to hydrate my skin quickly so I used this face mask on three consecutive nights and have since switched to once a week. I’ve seen a big difference in my skin and I don’t have any dry patches at all. This product is simply amazing. While I was there I also picked up a sample of their Make a Difference Moisturiser which is designed for people suffering with dry skin. After just a couple of days of using both of these products my dry skin problems were resolved and I have now ordered the moisturiser too! Reviews on both will feature on my blog soon. 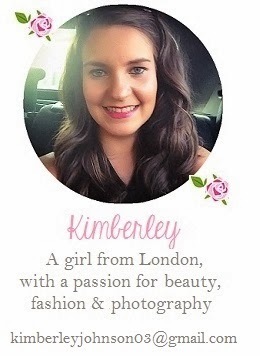 Blogging | Cosmo Blog Awards – Vote For Me! Next Post Giveaway | Benefit Product Giveaway!! The mulberry bag is so gorgeous! I'm hoping to buy one in the future. 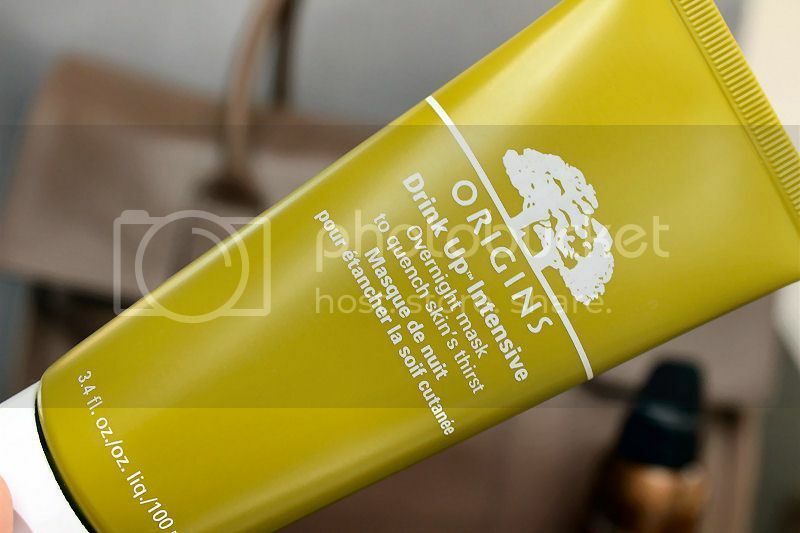 I also want to try the origins drink up mask, I've seen so many good reviews about it. It sounds really promising! I'm in love with your bag! Also the billion dollar brows looks interesting! the Taupe Bayswater Mulberry bag is my fovoutite, i like't verry bad! Your photos look so well taken, also I really want to try that Origins mask, sounds like just what I need. I hate to think how much that bag cost! I love your new Mulberry, it's beautiful. Oh my, that bag is gorgeous!! :O I love a good taupe bag and this one just hits the spot for me! How much did you pay for it in the end? The Origins overnight mask looks pretty great aswell.. I'm currently on the lookout for one and trying the Brand Origins has been on my to do list for quite some time.